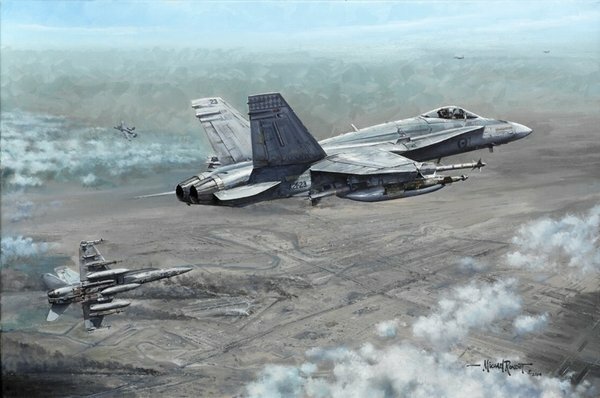 Magpies over Baghdad portrays a pair of 75 Squadron F/A-18 Hornets during a close air support mission flown in support of US Marines over Rasheed airbase near Baghdad. The leader is tipping-in to attack a target with GBU-12 laser-guided bombs whilst his wingman watches and waits for his turn to attack. In the background, above the smoke from burning buildings, vehicles and oil fires, the Hornets share their ‘killbox’ airspace with a USAF A-10 recovering from its attack on the same target area, and a pair of F-15s can be seen overhead Baghdad. The entire scene is carefully constructed from the pilots’ combat reports, and from reconnaissance imagery taken during the battle for control of Baghdad, giving the print a unique authority and accuracy.